You’ve paid off the credit cards and the car payment—the only debt you have left is student loans. Paying off student loans seems like the insurmountable mountain. More and more students are graduating with student loan debt, and according to CNN Money, the average college-educated student graduates with $25,250 in student loans. According to a student loan calculator, it would take 29 years and 2 months, to pay off $25,000 in student loans with a monthly payment of $150 and an interest rate of 5.9%. You will also pay $27,350 in interest. Yes, that’s more than the original loan amount itself. Talk about a wake-up call. When it comes to paying off student loans, you need a plan to pay them off faster unless you want to spend years paying them off—and that includes thousands in interest payments, as well. I made the mistake of ignoring my student loan debt for the first few years after college. It was more glamorous and fun to have extra spending money. I decided to pay off my higher debt first—credit cards and student loans. Now that those are paid off, I plan on contributing the same amount toward paying off my student loans in an accelerated fashion. Don’t splurge on the nicer apartment or buy the fancier car. Work on paying off your debt first. If there’s any point in your life where you can get away with eating cheap food and wearing old clothing, it’s in your early 20’s. Continue to live like a college student by sharing an apartment and perhaps taking public transportation if you live in a city where it’s easily accessible. Don’t go out buying things you don’t need simply because you’re now making your own money and bringing home a paycheck. In the past five years since graduating college, I have more than doubled my salary from my first post-college paying job. When you make more, you need to pay more. Yes, it may be tempting to start buying more things, but you’re just adding to your debt. 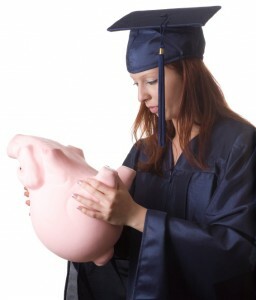 The more you spend on getting your loans paid off as quickly as possible, the better off you’ll be in the long term. Agree to put at least 75% of your new raise toward debt while allowing yourself to enjoy the other 25%. It’s important to prioritize what’s important to you. Obviously your education was a big investment in your life. Don’t let your student loans be the anchor that holds you down for the rest of your life. ICE: Short term loans to the rescue! ?